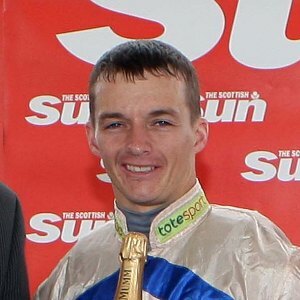 David Allan began his career as an apprentice with Jack Berry and is now the retained stable jockey to trainer Tim Easterby’s North Yorkshire operation. After riding his first winner aboard Peter’s Imp in the Grandstand Apprentices’ Handicap at Warwick on 22 July 2000, he went on to establish himself as a respected rider on the northern circuit. Allan, whose major victories include the 2009 DBS £300,000 St Leger Yearling Stakes on Midnight Martini, and both the Chipchase Stakes and Hackwood Stakes atop Fayr Jag, notched his highest seasonal tally in 2010 when registering 72 wins. He only managed 36 wins in both 2012 and 2013. He has spent time riding in India during the winter months and partnered Moonlight Romance to win the Indian Derby in February 2011. His partner is fellow jockey Natalia Gemelova and they have a daughter, Nicole. After tasting success in the QIPCO British Champions Series with Hamish McGonagall, Allan could well earn his first Series win with the fast-improving Mattmu. Tim Easterby’s sprinter ran with great credit to finish third in the Coolmore Nunthorpe Stakes behind only Mecca’s Angel and Acapulco. He also finished third on High Jinx for Easterby in the 2017 Yorkshire Cup.